Lake Sumner Conservation Park can be accessed from the Lewis Pass Highway, about two hours drive Northwest of Christchurch on State Highway 7, or by turning off at Waikare to Hawarden and following the unsealed Lake Sumner Road to Lake Taylor. A wide variety of day walks and tramps suit most tramping abilities. All the tracks are graded as tramping tracks. Extreme weather conditions can occur in any season. Trampers need to be self-sufficient. The limited roading access is shown. The combination of contours and relief shading, gives a realistic landform. Vehicle access is restricted beyond the locked gate at Loch Katrine. 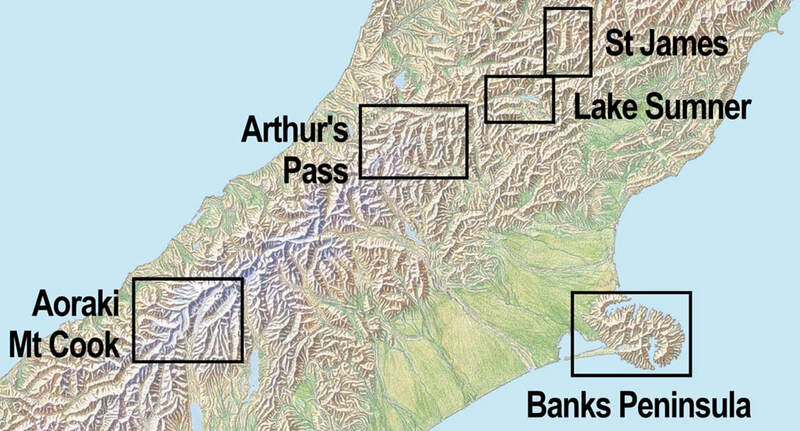 The Te Araroa Trail passes diagonally across the map. Large format 840x630mm (approx. A1) Folded to 120x210mm.